The range extender will only detect and work with the 2.4 GHz network. For better connection and performance, it is recommended to use the following security types: Wi-Fi Protected Access (WPA)2/WPA Mixed Mode, WPA2 Personal, and WPA Personal. NOTE: The SSID and security key are your wireless network’s settings. If you do not have these settings, contact your router’s manufacturer to get assistance in getting them. If you are using a Linksys router, click here to learn how to check your wireless settings through its web-based setup page. QUICK TIP: If you already tried installing the range extender and encountered an error, you may need to reset the range extender before you proceed with the steps below. For Windows 8 computers, you can set up the range extender manually. Insert the range extender’s Setup CD into your optical (CD-ROM or DVD-ROM) drive. 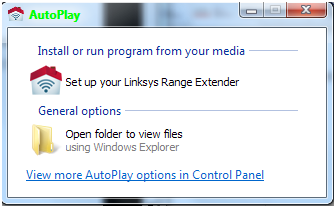 When the AutoPlay window appears, click on the Set up your Linksys Range Extender option. NOTE: If you can’t see the AutoPlay window, go to your computer’s local drive and double-click the icon to proceed. 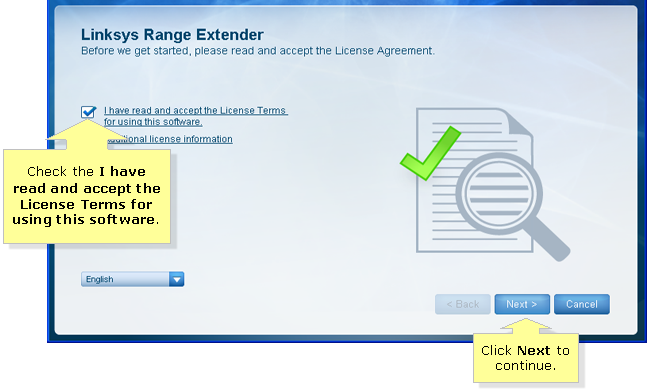 When the End-User License Agreement window appears, check the I have read and accept the License Terms for using this software box, and then click Next to continue. Wait while the software is preparing to set up the wireless connection with your router and range extender. NOTE: In case you encounter the error messages below, follow the instructions provided in the setup window and then click Next to proceed. Once your wireless connection has been detected, plug your range extender into an electrical outlet and then click Next. 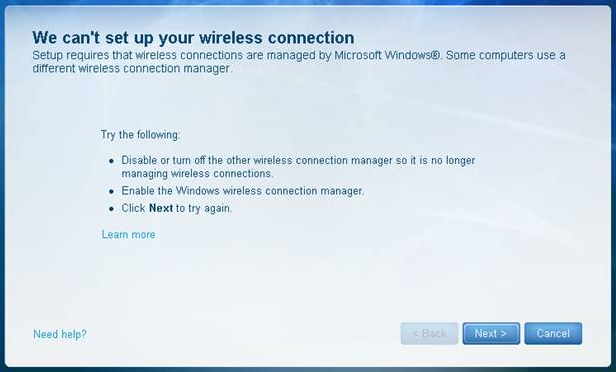 NOTE: The software will then search for your range extender and will attempt to connect to your wireless network. QUICK TIP: To prevent the error about your range expander being not detected, ensure that the device is within close range to the router at this point of installation. 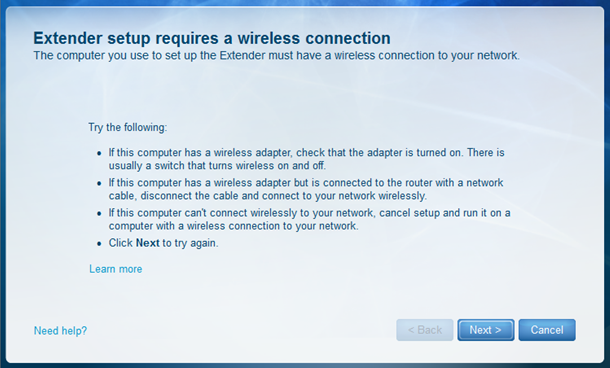 If the setup software is able to detect your range extender, it will prompt you to choose a wireless network. Select your range extender's name and then click Connect. NOTE: The default name of the range extender is LinksysExtenderXXXXX where the XXXXX represents the last five (5) digits of your range extender's serial number. 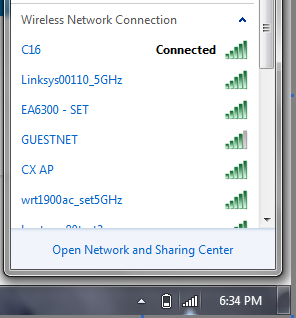 Select the Wireless Network Name (SSID) of your router, and then click Next. 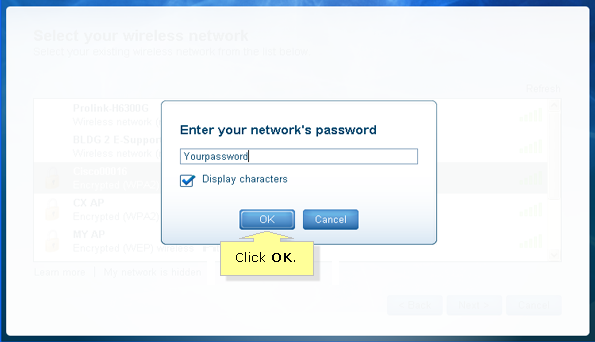 Enter your wireless network’s password or security key. Click OK. NOTE: WPA keys are case-sensitive (abc is different from ABC). WEP keys are hexadecimal (0-9 and a-f) characters. The screen will display that your range extender is being set up. 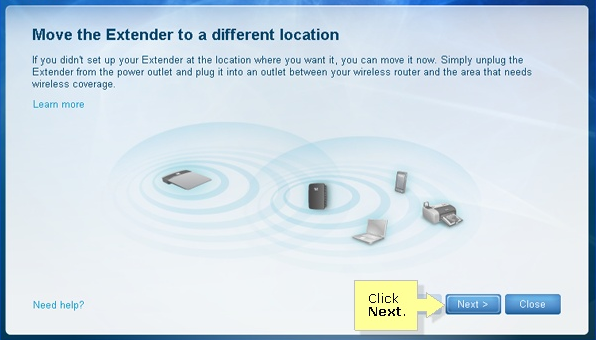 If you want to transfer your range extender to a different location, follow the instructions provided in the setup screen, then click Next. NOTE: The software will check your range extender’s connection to the wireless network. 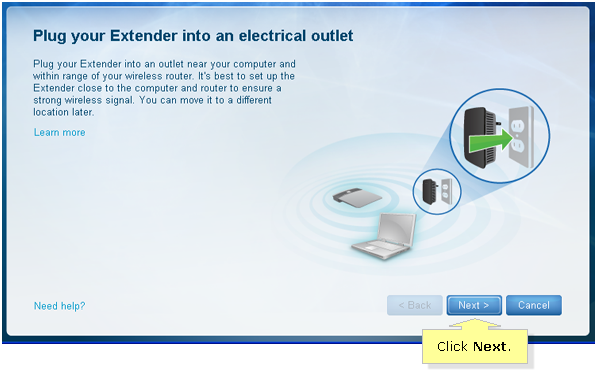 A window should appear to inform you that your range extender has been set up successfully. Click Close to end the setup process. NOTE: When you check your wireless network connection, you will no longer see the range extender's name. Instead, it will show that you are connected to your router. For optimum performance, it is recommended to use a Linksys Wi-Fi or Smart Wi-Fi Router for your RE1000 or RE3000W range extenders. 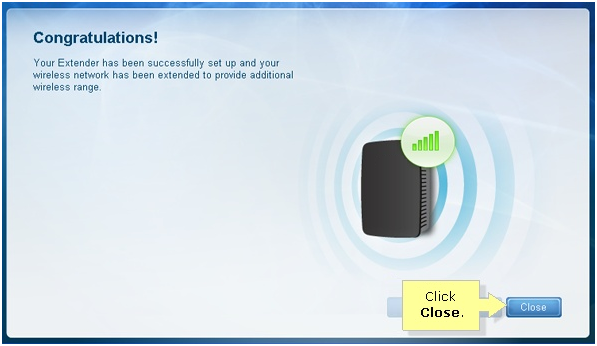 NOTE: To view the video instructions on how to manually set up your Linksys RE1000, click here. 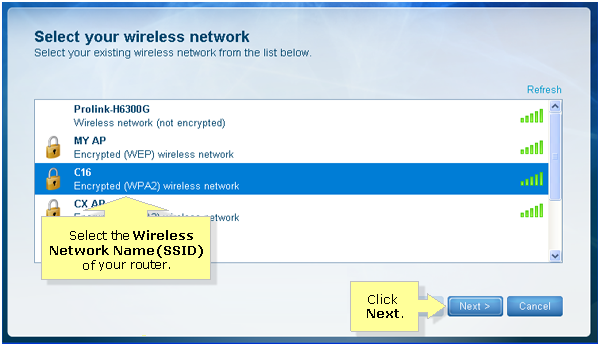 To manually configure your wireless range extender, click here.